Home > Finishing Off > Triple Glazing: Is It Worth the Money? Windows form a part of the home where we can really improve energy performance. Ask yourself this, do we really need three panes instead of two and is it cost effective for the self builder? Just as double glazing is two pieces of glass with a sandwich of air between it triple glazing is three pieces of glass with two air gaps between the glass panels. Obviously it is a little more technical than that but with a gas such as argon trapped between the layers we then find that the windows become more energy efficient. The British Fenestration Rating Council (BFRC) is a subsidiary of the Glass and Glazing Federation. The BFRC scheme is the UK recognised system for rating the energy efficiency of windows with grades from A down to G. When purchasing windows from a member of the association they will be able to furnish the self builder with information such as energy ratings, heat loss and resistance to condensation. The windows will also be labelled with the correct grade. Triple glazing first became popular in Scandinavian countries and some say that the best triple glazing products are still to be found there. Triple glazing can be 20 – 40% more expensive than double glazing and take more than a decade to recoup the cost. With rising fuel charges this could now take less time. Whatever the cost - you, as a self builder, must calculate the expense of having triple glazing at the time of your build. You may not notice much difference in energy saving between triple and double glazing unless you have large windows or patio doors. Some people have compromised with their glazing and have added a single glazed unit along with their double glazing at the time of their build. This will go some way to improving insulation but will not be as effective as triple glazing. A definite benefit of triple glazing is that outsize noise is greatly reduced. If your self-build home is near a main road or perhaps an infill plot in a busy street you will benefit from triple glazing in sound reduction alone. Windows and patio doors with triple glazing will be heavier than double glazing and the frames holding them will be thicker as well. Allowances will have to be made by your architect for the additional size when drawing up plans for your build. There are fewer suppliers of triple glazing than there are double glazing suppliers in the UK. As a self builder you can expect to purchase at a trade price rather than as a retailer. Do your homework properly as you can make quite a saving. Keep up to date with building magazines and take note of any question that is asked about glazing. Read the advertisements and speak to representatives of all glazing companies. You may find you need to import the windows of your choice, how much would the shipping charges add to your costs? 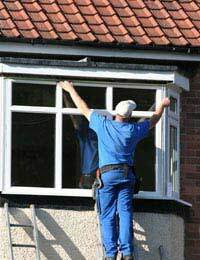 Do not discount independent glazing companies as they may give a discount for self builders or indeed for supply only.